Breaking down Hudson City Bancorp's prospects before second-quarter earnings are released this Wednesday. Hudson City Bancorp, (UNKNOWN:HCBK.DL), a $38.2 billion bank headquartered in Paramus, N.J., will release its second-quarter results on Wednesday. Let's take a moment today to review the bank in anticipation of those numbers. Hudson City is in a unique situation, one that hangs over any investment decisions in this company. Over two years ago, Hudson City agreed to merge with M&T Bank (NYSE:MTB). That deal has not yet closed due to regulatory holdups related to M&T's internal controls. Just last month, M&T was forced to forfeit over $500,000 found to have been laundered by one of the bank's tellers on behalf of a drug gang. After such a long delay, and with the merger itself still uncertain, Hudson City management has driven forward with a strategic plan for the bank as an independent institution. We'll review the bank today in that same light. When I evaluate banks, I follow a model made famous by former Wachovia CEO John Medlin: soundness, profitability, and growth. As investors, we then look at valuation and the potential for investment after gaining a better understanding for each bank. Soundness refers to the bank's asset quality. Generally speaking, this means loans. If a bank makes loans that are never repaid, that institution will quickly fail. The best banks put risk management first, ensuring that shareholder capital is protected if a portfolio of loans turns sour. To measure this, we'll look at Hudson City Bancorp's nonperforming assets and provision for loan and lease losses. Put simply, nonperforming assets are loans or other assets that have fallen seriously delinquent or are in foreclosure. The provision for loan and lease losses is a reserve of money that the bank pulls out of its income each quarter to guard against future losses in the loan portfolio. Banks are required to maintain certain levels of reserves, but within that management has plenty of wiggle room. Over-reserving increases protection but hurts net income; under-reserving increases risk but keeps net income high. For the quarter ended on March 31, Hudson City had 2.9% in nonperforming assets as a percentage of total assets. The FDIC reports that banks with total assets greater than $10 billion on average had 1.5% in nonperforming assets as a percentage of total assets. Hudson City's levels of non performing loans and loan loss reserves. Source: BankRegData.com. Hudson City did not add any new reserves to its loan loss reserves in the first quarter. This industry average for new loan loss reserves was about 5% of operating revenue, according to the FDIC. The bank does appear to have sufficient reserves; the chart here clearly shows that the bank's reserves are in line with the overall trend in problem loans. It's also worth noting that the number of loans past due more than 30 days but less than 90 days has decreased 31% since the fourth quarter of 2012. These loans would generally indicate if the bank's nonperforming assets stand to rise or decrease in the near future. Even with the improving trends, Hudson City is far from out of the woods. The bank still has a large portfolio of problem loans, a fact that investors should not overlook. Any investment in a business is an investment in that company's future earnings, so profitability is a particularly important consideration for any bank investor. The first question, perhaps most obviously, is whether the bank actually generates a profit at all. According to data from the FDIC, 7.3% of U.S. banks failed to generate a profit at all in the first quarter. That's one in every 14 banks! For Hudson City, the first calendar quarter of 2014 wasn't that bad. The company generated total net revenue of $150 million for the quarter-- that is, total interest income plus noninterest income minus interest expense. Over the past 12 months, Hudson City generated $605.3 million in total net revenue. Eighty-eight percent of that revenue was attributable to net interest income, the difference between interest earned on loans and that paid out to depositors. The remaining 12% was through fees, trading, or other noninterest revenue sources. The bank turned a profit margin of 30% on that revenue. For the first quarter, the company reported a return on equity of 3.6%. 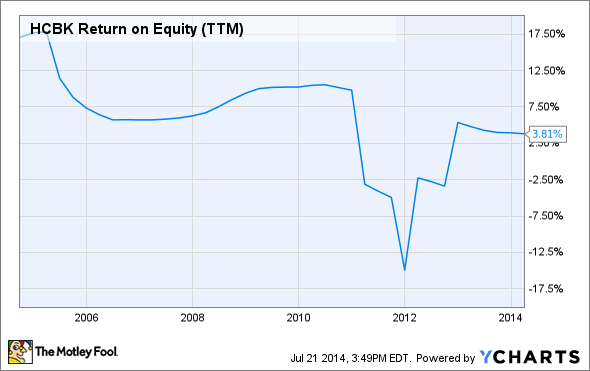 Of the banks covered in this series of articles, the average return on equity was 8.9%. The FDIC reports that the average ROE for U.S. banks with total assets greater than $10 billion was 9.1%. It's also worth noting that the bank's net interest margin -- the difference between the interest it collects on loans and pays out on deposits -- is a tiny 1.39%. 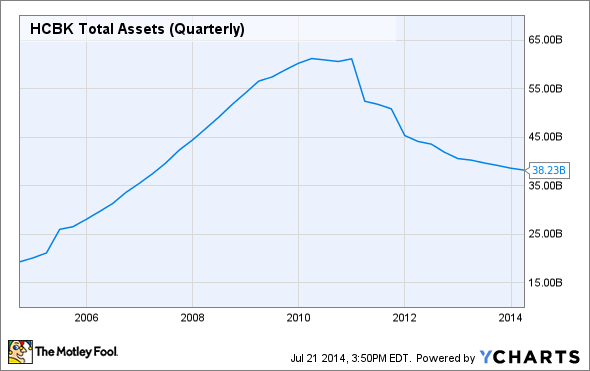 Most banks with this level of total assets generate a spread of 3% or more. The bank's super-thin interest margins are a serious hindrance on loan-term profitability. Leverage is a double-edged sword for banks and could easily fit into either the soundness or profitability categories. We'll call it a subset of both and discuss it here. Leverage is just part of the game with banks, so if you're a conservative investor who focuses on conservative capital structures, the banking industry may not be the best place for your money. Adding leverage is an easy way to juice return on equity, which is generally speaking a good thing. The bank increases assets, and thus earnings, while maintaining a lower capital level. The result is a higher numerator, a constant denominator, and a larger return on equity number. The math does the heavy lifting for you. On the flip side, too much leverage can put the bank on thin ice if the loan portfolio takes a turn for the worse. A stronger equity base protects the bank from bankruptcy and bailouts, two outcomes that are both politically charged and downright terrible for shareholders. Banks use all kinds of esoteric and overly complex accounting methods to determine leverage. We'll keep it simple here with an old-fashioned assets-to-equity ratio. The lower the number, the less levered (and more conservative) the bank. Hudson City's assets-to-equity ratio comes in at eight times. The average of the 62 banks analyzed in this series of articles was 9.1 times. Hudson City saw its revenue decline by 16% over the past 12 months. That compares with average growth of 5.74% of the 62 banks analyzed. This change in revenue corresponded with a -20% change in net income over the same period. The peer set averaged 14.1%. Fifty-four percent of all U.S. banks saw year-over-year earnings growth in the first quarter. The decrease in both revenue and net income also corresponded with a modest decrease in total assets at the bank. On valuation, Hudson City's market cap was, at the time of this writing, 1.1 times its tangible book value. The peer-set average was 1.9 times. Many investors use a general rule of thumb of buying a bank stock when the price-to-tangible book value is less than 0.5 times and selling when it rises above two times. For me, that method is far too oversimplified. It sometimes makes sense to pay a premium for a bank stock that places a high value on credit culture and asset quality. These banks will survive and prosper while others fall by the wayside. That security can be worth a premium. Likewise, a bank that relies heavily on leverage to achieve an above-average return on equity may not be worth the price, even if the price-to-tangible book value is low. That risk may not justify even a healthy discount in price. Based on the factors discussed in this article -- soundness, profitability, and growth -- Hudson City appears to be fairly valued. The bank trades at a healthy discount of just 1.1 times tangible book value, and that discount is justified by Hudson City''s ongoing credit quality issues and struggling profitability. The bank is in an unfortunate jam. Banks need strong core earnings, driven by a healthy net interest margin, to power through the credit problems left over from the financial crisis. Hudson City does not have this earnings engine, and as a result the loan portfolio continues to struggle. Hudson City may one day turn the ship around, but that may be a long way off. That is, unless M&T Bank cleans up its internal control issues and swoops in to complete the proposed merger. 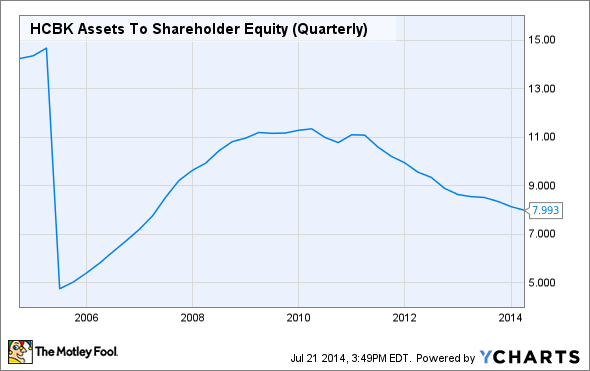 Was This $5.5 Billion Bank Merger Really Worth the Wait? How Much Longer Will the Government Delay This Merger? Where Will M&T Bank Grow Next?